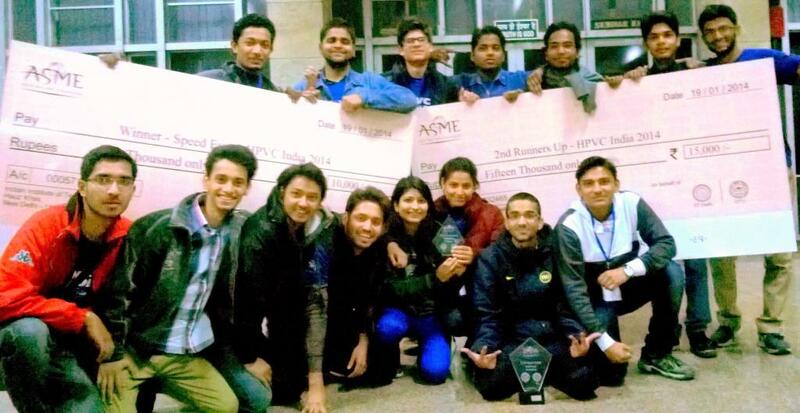 Jamia Millia Islamia participated in an International event organized by American Society of Mechanical Engineers (ASME)-Human Powered Vehicle Challenge (HPVC) – 2014 which was held at Indian Institute of Delhi (IIT), Delhi from 17-19 January 2014. The HPVC is an inter college design, fabrication and racing competition for students wherein teams have to conceptualise, design and fabricate a human-powered vehicle for a three-day event comprising design competition, endurance race and a drag race entries. This year’s event was a platform for students from all over India to showcase their technological and engineering prowess by engineering a human-powered vehicle. The HPV Team of Jamia Millia Islamia brought laurels to the University and secured an All India Third Position and was adjudged the Winners of the All India Drag Race Event. The position was secured by beating the likes of IITs, NITs, BITS Pilani, ISM Dhanbad and various other reputed colleges from all over India. The edge of the Jamia Team was the simplicity of design and easy accessibility and versatility. Their vehicle was called FLARE and could sprint at 55kmph. There were 15 young mechanical engineers from Jamia who were part of the team. The high point for the Jamia Team was the drag race event where Jamia Team was unbeaten champions. It was a double elimination race and Jamia made a record by measuring 750m track in just 50.1 seconds. The Team is looking forward for further optimization of the vehicle and enhancing the performance and improving their rankings in upcoming competition.